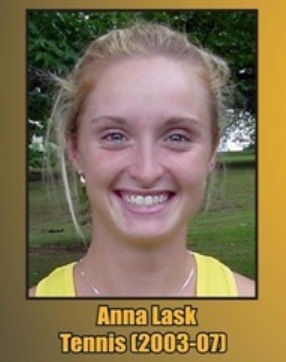 On July 15th it was announced that Anna Lask would be inducted into the Murray State Athletics Hall of Fame on February 21, 2014. I wrote this article about Anna and her sister Rachel in October of 2006. For the last three years Anna and Rachel Lask have been stalwarts on the Murray State women’s tennis team. And while they have enjoyed success on the court their contribution to the university goes far beyond that. “They’ve both been leaders in the classroom, in the community, in the athletic department and on the court,” coach Connie Keasling said. “And they have been great about working in our clinics and camps. A three-time all-conference selection, Anna will finish among the top three in school history in matches won. In three seasons she has 51 victories and 11 losses. Rachel, a two-time all-conference honoree, has a three year record of 46-11 in singles play. Playing together, the sisters are 51-11 in doubles competition. As the two look back on their career it’s hard to believe it’s almost over. “It’s gone by so quickly,” Anna said. “It seems like just yesterday that we were going to our first tournament as freshmen. Of course, there have been a few bumps along the way. “Our freshman year we came in and coach (Keasling) had a big pile of uniforms in the floor and told us to pick out the ones that were best for us,” Rachel said, laughing. “Well a lot of the girls from the year before wore extra large or large so we had to wear clothing that was way too big. And even though they are fierce competitors on the court the Lasks are never too serious to have fun. The one disappointment in the last three years has been the absence of an OVC championship. Rachel is considering a career in medicine. Anna is an artist majoring in interior design. “Maybe I’ll be on Extreme Home Makeover,” she said with a giggle. “I’ll be the one bulldozing down the house. Regardless of where they go after they leave MSU both will remember Keasling fondly. “She’s a great coach,” Anna agreed. “She’s very organized and she loves her team. I think we’re like her family. There’s no doubt that Anna and Rachel are winners, both on and off the court. Playing for legendary coach Connie Keasling, Anna Lask's record at Murray State ranks among the best to ever wear the blue and gold. Lask arrived at MSU in 2003 and quickly established herself as an outstanding singles and doubles competitor. She is currently the all-time leader in singles victories with a mark of 104-39, and in doubles with a 105-34 record. Many of her doubles wins came alongside her sister, Rachel. When her singles and doubles wins are combined, Anna Lask has an MSU-best of 209-73 (.741). A four-time All-OVC selection, Lask was OVC Player of the Year in 2007 as a senior and helped the Racers to a spot in the NCAA Championship. She earned the OVC Scholar Athlete Award in 2007 and the OVC Medal of Honor. Also in 2007, Lask was recognized as ESPN The Magazine Academic All-District IV Al-Large First Team as selected by the College Sports Information Directors of America (CoSIDA). She now resides in Prospect, Ky.